I made this costume for my 14 month old daughter Aubrie. I was inspired to make this costume from a previous experience, in which I made a similar costume for myself 2 years ago. 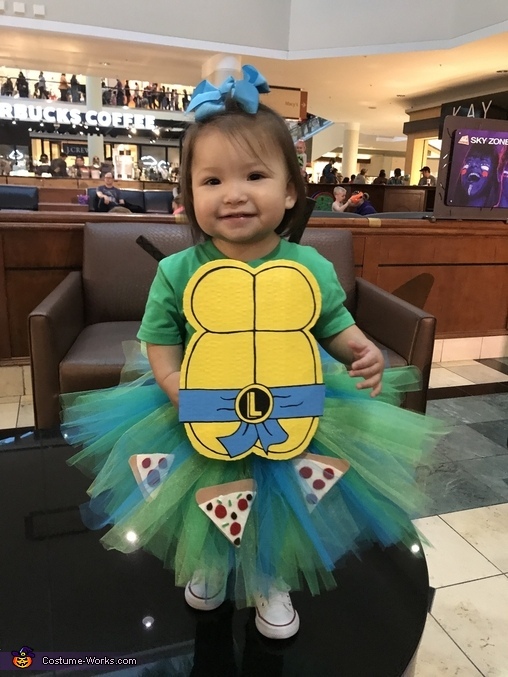 I, personally, love the Ninja Turtles and I had so much fun making my own that I wanted to make one for my daughter, of course on a much smaller scale. Front and back turtle shells were cut from cardboard sheets, I drew the design on the cut outs and painted them. The shells were attached to her green shirt using Velcro strips. The tutu was made from blue, light and dark green tulle. The pizza slices were cut out from felt sheets. They were then glued together and then glued to the tutu using fabric glue. We used 2-5 gallon paint sticks for the swords. They were cut into the shape of swords using a jig saw. Three different cuts were made to make the entire sword, they were then pieced together and glued with wood glue. Once they dried, I then painted them accordingly. My daughter was not keen on wearing a mask so we topped her head off with a blue bow. Since I still had some unused product from when I made mine, I spent around $25. I am very proud of this costume and it was so much to make. I cannot wait until next year!